The Mars wings offers high quality diamond and jewelry with very reasonable price . A ring model of classic and fashion combined. Mars wings has been sticking to bring the patterns classic with fashion to every customer,Let their charm and confidence induce more attractive. Comes with a free exquisite gift box. Sterling Silver is silver white, but is prone to oxidation, will become darker, then why do we often see sterling silver jewelry is very bright color. Because general sterling silver jewelry in the surface, plating a layer of platinum, keep jewelry luster. So silver jewelry to maintain long-term bright, it should be thicker in the outer jewelry electroplating platinum, and better work, let him keep permanent gloss, Mars wings do these, which enable us to stay competitive. It is handmade and inlaid, and stone is not easy to fall.Warranty full refund within 90 days by missing stone! It comes with a beautiful jewelry case.Sweetheart gifts and prom wear/bride/bridesmaid's gifts ..On special festivals,parties,datings, propose /weddings or Valentines Day, Mothers Day, anniversaries,Birthday Christmas Thanksgiving or daily life;To your girlfriend,lovers,wife,mom,daughter or just ourselves. 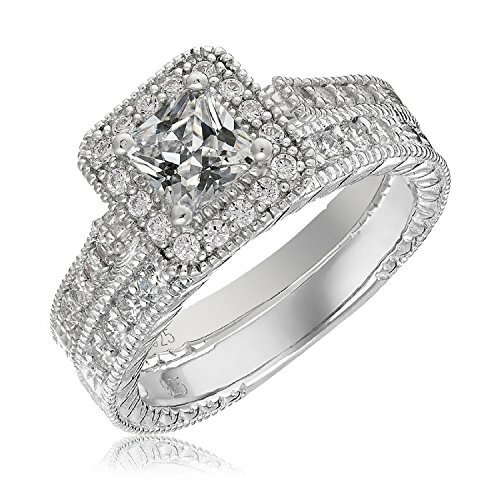 Our wedding ring sets represent The Only Eternal Love,gift her Your Best and make her face Smile. If you have any questions about this product by Mars wings, contact us by completing and submitting the form below. If you are looking for a specif part number, please include it with your message.